The Barn Dining at Walden is known for their many choices of amazing soups. I am writing today to share my own experience as a recent guest at the Barn. I am please to say that not only was the food fantastic but the service as well. After receiving my cocktail, the server asked if my husband and I would like to hear the Features. I have heard many great things about the choices that are featured in this fine dining facility and were eager to hear about them. The server started to tell us the incredible list of appetizers, soups, meats, and seafood. Out of all of the different choices, the soups were the most interesting. I have never attended a restaurant that featured so many different kinds. Not only was there many choices, but each soup was very unique with one another. The server kindly told my husband and I seven different kinds of soups without missing a beat. I was very impressed with her memorization. 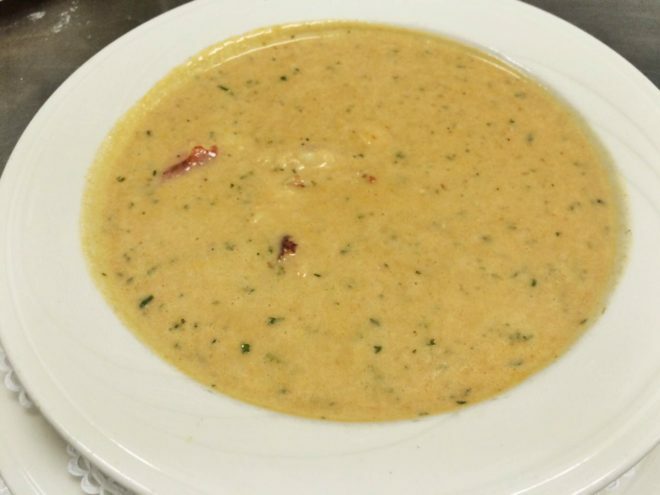 The seven different kinds of soups were the following: New England clam chowder, tomato and wild rice, butternut squash and cinnamon cream, cream and mushroom, split pea, baked French onion soup and lobster bisque. The server kindly repeated the list of soups for me three times, because there were just so many to choose from! I asked the server what she would recommend; she smiled brightly as she told me that it would be the lobster bisque. She explained how not only it is the most well loved soup for both guests and members, but it’s her favorite as well. The way she explained how incredible it was, I could not help but order it! It was quite delicious! Not only did the lobster bisque soup taste incredible, but it had chunks of lobster meat! This was probably the first time I have ever ordered lobster bisque that had real pieces of lobster meat in it as well as plenty of it! What a wonderful restaurant and fabulous soup! I hope that I will be able to make another visit to this elegant restaurant, so I can have the lobster bisque again! Thank you everyone who made my husband and I’s experience at the Barn amazing and fun.